STARDOLL FREE | Underneath Stardoll Blog: UPDATE: Levels on some clothing and decor items. Some clothing items now also have levels on them like this top from Bonjour Bizou seen below. In order to buy this item you would need to be level 3 or above. There are also a few other item in starplaza with level tags on them. When it comes to selling level items in starbazaar the same rules apply when buying in starplaza. You need to be of that level to buy the item even if buyng through starbazar. Here is what it says in the help section about it. There are not too many level items in starplaza right now but I'm presuming in the future items for different levels will become more common. Level 91 and 93? A bit high levels for items we were all able to buy yesterday don't you think? It's fair enough if you want to create new items for the small amount of people who are a level 93 and above but you should create new items to put at high levels and and not just use existing items we were able to buy before and make them a ridiculous high level all of a sudden. 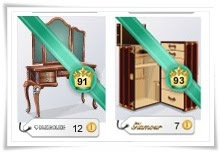 Callie.Stardoll isn't even close to the required level to buy these items so it seems a bit odd to me to be selling them for such a high level. Luckily for me I already own both items so in a way they're not even worth the level they are because a lot of people of a lower level will already previously own them.